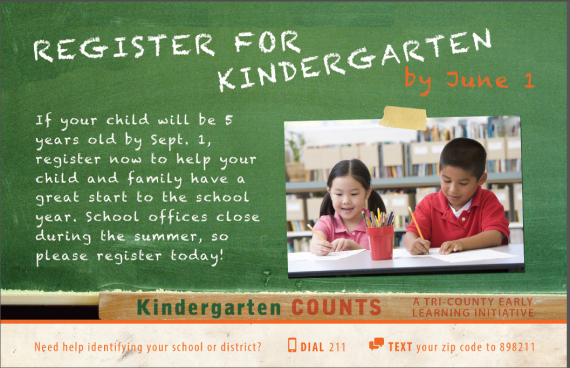 Registering for kindergarten before June 1 is one of the easiest ways to put children on a path for success in school. Our community’s “Register for Kindergarten by June” campaign is aimed at increasing on-time kindergarten registrations throughout Multnomah County. When families enroll their children in school before schools close for the summer, it gives families time to get to know their school and teacher, connect with summer transition activities and gain access to free resources. Kindergarten transition activities vary by school, but can include summer reading programs, kindergarten transition programs and family orientation. All of the activities are designed to help children become comfortable with the classroom setting and reduce anxiety that parents often feel about leaving their kindergartener on the first day of school. Children learn their teacher’s name, meet their classmates, tour the school and learn basic classroom etiquette—all things that help them get focused for learning earlier in the school year.